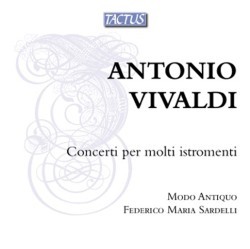 Violin concertos constitute the largest category in the catalogue of Antonio Vivaldi's oeuvre. Many of them are notable for their technical brilliance and the genre as such was very common. The concertos which are the subject of the present disc are a little different in that regard. Not many composers wrote a large number of concertos for three or more solo instruments. More than thirty Vivaldi concertos of this kind are extant. They are called concerti per molti istromenti and include parts, often for very different instruments. Among the best known are those for violins, sometimes with an additional cello, from his op. 3, printed in Amsterdam in 1711 under the title of L'Estro armonico. The first concerto of this disc is also connected to Amsterdam. The Concerto in D (RV 562a) is one of two versions of the same concerto. This version is part of a manuscript of ten concertos which were performed in Amsterdam on 7 January 1738 on the occasion of the first centenary of the town's theatre. It has been suggested that Vivaldi himself was present at this occasion, but that has been questioned. It is scored for violin, two corni da caccia, timpani, two oboes, bassoon, strings and bc. The specific reference to the timpani is interesting. This is the only concerto in Vivaldi's oeuvre in which they are explicitly mentioned. It was quite common at the time to add them in music with trumpets, even when that was not specifically required. Here they play with the two horns in passages marked as trio. This concerto is suitable for the occasion as the opening movement starts with a kind of fanfare. The second movement is for violin and strings alone. Vivaldi had close contacts with the court in Dresden where his music was quite popular, partly due to the promotional activities of Johann Georg Pisendel who had met Vivaldi in Venice. This resulted in Vivaldi composing concertos specifically for the court, such as the Concerto in g minor (RV 576), with the addition per Sua Altezza Reale di Sassonia (for His Royal Highness of Saxonia). Said Highness was Friedrich August who loved eccentricities, and that comes to the fore in Vivaldi making extensive use of unisono passages, especially in the first movement. Many of these concertos are quite demanding, but the court orchestra in Dresden had many virtuosos in its ranks, and the performance of such pieces will not have given them any trouble. For the most part we do not know for which performers Vivaldi composed these concertos. Some may have been the result of commissions, but in the Ospedale della Pietà he had many players of different instruments at his disposal, and many of them were true virtuosos. It is remarkable that a number of these concertos include parts for two horns which were among the most difficult of the time. They participate in the Concerto in F (RV 569) which closes the programme. As with the first concerto on this disc the violin is the dominant solo instrument; it is on its own, supported by the tutti strings, in the slow movement once again. This difference in scoring is not uncommon: in concertos with solo parts for brass (trumpet, horn) the latter mostly keep silent in the slow movements. That is also the case in the Concerto in F (RV 538) for two horns, strings and bc. It is not catalogued among the concerti con molti stromenti but it could take its rightful place there as there is in fact a third solo instrument. The slow movement (largo) is scored for cello and basso continuo. Something comparable happens in the Concerto in d minor (RV 566). It is scored for two violins, two recorders, two oboes, bassoon, strings and bc, but the largo is a trio for two recorders and bassoon. The first movement opens with a single chord of the tutti which is followed by passages for the various pairs of solo instruments. This disc is reissued by Tactus which also released the first edition; it was later included by Brilliant Classics in its Vivaldi Edition. If you own that disc you may still consider purchasing this reissue because - unlike the Brilliant Classic disc - it comes with interesting liner-notes by Federico Maria Sardelli. This is helpful in putting this part of Vivaldi's oeuvre in its historical perspective. The performances are vibrant and engaging; the virtuosity of the soloists - especially the horn players - is impressive. This disc is well suited to repeated listening.